In the summer of 1964, three young men who were in Mississippi as part of the Freedom Summer effort to register African-Americans to vote. While there, they were killed by the Ku Klux Klan, with the help of local police. This book, written for teens, introduces readers to the three young men, the terrible events of that summer day, and the long journey to try and bring those responsible to justice. The book begins with an overview of conditions for blacks in the South in the 1960s, Mississippi's resistance of compliance with integration, and the rise of the KKK. Then the facts of the murders are recounted. 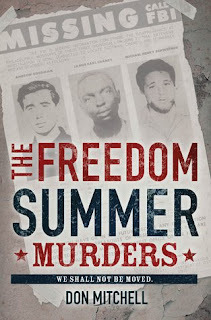 The next three chapters focus on the lives of each victim: Andrew Goodman, James Chaney, and Michael Schwerner. The rest of the book recounts the efforts to find and punish the people responsible. This book reads like a typical nonfiction book for young people. It's a horrifying story, and pretty shocking when you think about how recent it actually was, but it wasn't especially thrilling to read. Honestly, I just wanted to be reading a novel. But we picked this for my book group at work and I did actually want to learn about this dark event in our history. While I was reading this book, the verdict in Philando Castile's murder was announced. Calling the verdict a miscarriage of justice is putting it really, really mildly and I think my rage was compounded by the fact that I was reading a book in which a cop helped murder civil rights workers because he was horribly racist. I mean, seriously, United States, will you ever learn? It's as though nothing has changed. Of course, today's killings of black men by police aren't intentional, they are "misunderstandings," and somehow that makes it totally fine for these killers to remain unaccountable. All that to say that this book is still really relevant today, sadly. I'd be surprised if something this blatantly racist happened and the perpetrators got away with it (though maybe not in Mississippi, based on what I've heard) but we've still got a long, long way to go before we achieve racial equality. The author does a good job of relaying that as well, and putting this story in a larger context.